Limited Time Offer: Enjoy FREE Shipping on most of our jewelry products. No coupon required. All orders will be shipped after October 22nd, 2017. Inspired from traditional, handcrafted Temple Style Short terracotta Maanga Haaram in Red and Green!!! All orders will be processed within 3 business days. If you have any other question, please contact us. All merchandise is shipped from our warehouse in Ohio, USA. This item in Traditional Necklace Sets category was first added to our catalog on 11-01-2017. Buy Temple Style Short Terracotta Maanga Haaram in Red & Green, sold & shipped by SowJy where you can shop online for Unique Handmade Terracotta, Fashion & Designer Ethnic Jewelry. 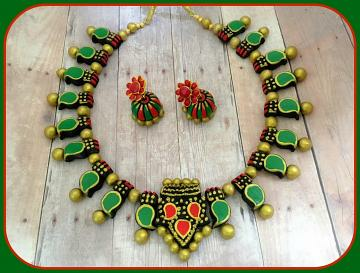 This Necklace Sets collection has been tagged as indian jewellery, baked clay, handmade jewellery, handcrafted teracota terracotta jewelry, fashion costume ornaments. Lovely peacock Feather Terracotta Set with Matching Jhumkas!!!!! Thank you so very much! Our order arrived already and all items are beautiful! !